Collected wreath making materials. Photo courtesy of Sunnyside Nursery. I think it is fair to say that most of us are not going to be spending a whole lot of time in our gardens this month, but that doesn’t mean we can’t still find ways to stay connected to them. Making winter arrangements from the bounty of our yards (or someone else’s, with permission of course) is a perfect way to extend the bond between plants and people that is so primal and essential to our wellbeing. When I gaze upon an arrangement of dried flower stalks and evergreens from my garden, I don’t see death and the end of a season, but rather I am transported back to spring and summer when those seed heads were colorful flowers covered with bees, birds and delicious fragrances. I also see new hope in the very seeds on those dried flower stalks, seeds that will bring forth the next generation of flowers in my garden. It’s an uplifting feeling that helps me get through the dark days of winter. While combining some evergreen boughs and dried flower stalks into an empty container and placing them on the deck is a simple and easy way to experience the garden this time of year, some of us prefer to go the extra mile and build something a bit more complex and formal. This is where the art of wreath making comes into my story. What started out as an attempt to generate some revenue for the garden center in the slow season has evolved into an annual event celebrating the incredible diversity of plants that live in our northwest gardens. 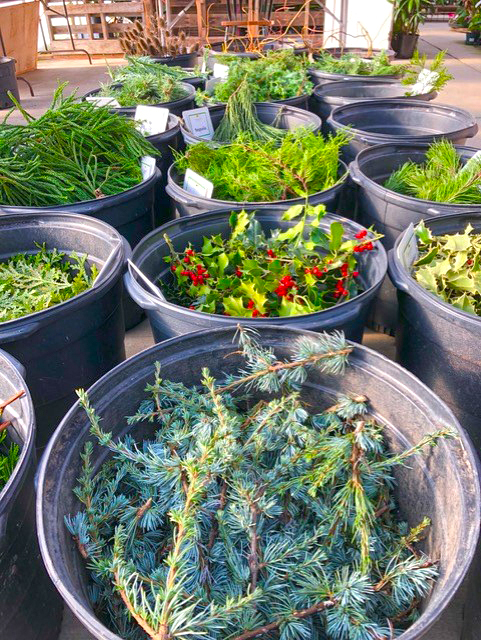 This time of year my staff heads out to collect as wide a variety as possible of evergreens, twigs, berries and dried flower stalks for customers to use to make their wreaths. We find most of these in ditches, vacant lots, people’s yards, parking lots, railroad right-of-ways, parks, and just about anywhere we can get permission to collect. Evergreens, such as pine, spruce, cryptomeria, cedar, cypress, sequoia, yew, juniper, and thujopsis, can all be found growing in our local landscapes. Broadleaf evergreens, like English and Japanese holly, Evergreen Huckleberry, and Box-leaf Honeysuckle, also provide nice accents. Dried flowers and seed heads, such as Siberian iris, statice, yarrow, hydrangeas, golden hops vine, Dock, native Spiraea, teasel, and cat tails, can add further visual interest. Even a noxious weed like Scotch Broom offers a unique texture to a holiday wreath. Once all of this plant material has been collected and cut into appropriate sized pieces, it is time for the customer to select and assemble it into a unique creation. (I can assure you that you don’t need to be a Martha Stewart to be successful.) With the wreath machines and wire forms we use today, it is so easy that you will amaze yourself with your creativity. I think I have as much fun watching my customers make these wreaths as they do making them. Each wreath becomes a unique reflection of its creator. I’ve seen wild and wooly ones with curly willow twigs shooting out like bottle rockets and fuzzy buds from the stag horn sumac nestled in amongst the greenery like sleeping elk. Conversely, some folks like to make their wreaths nice and tidy with perfect symmetry, clean and crisp edges with just a subtle accent of cones. You can tell a lot about a person by the type of wreath they make. Possibly the hardest thing to do is to decide what not to put in a wreath. While using one of everything may prove a bit chaotic, there is always enough variety to pick a theme of say golds and yellow or just blues and silvers. Whatever your mood or personality, nature will provide you with a plant to match it. Making wreaths is a great way to reconnect with the garden this time of year. It’s a chance to re-purpose our plants and give them one more time in the spotlight before they are relegated to the compost heap. It’s also an opportunity to spend some quality time with family and friends and build a tradition that will last for years. You’ll come away with much more than a decoration for your front door. You’ll gain a better appreciation for the bounty of the northwest and create a memory to look forward to this time next year. Sunnyside is offering wreath making every day from now until December 16, 2018, along with fresh cut Christmas trees (10% gets donated to The Marysville Food Bank).